Just what is Animal Communication? 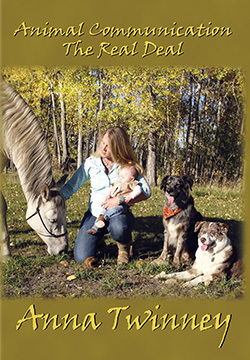 Join International Animal Communicator, Anna Twinney as she introduces you to amazing world of Animal Communication. Through demonstrations, lectures, and hands-on exercises, you will explore the amazing world of inter-species, telepathic communication, or “animal communication.” Using your inherit gifts, you will discover how to telepathically connect and communicate with a being of another species. This two-way communication is accomplished not only with words, but with images, feelings, thoughts, emotions and other intuitive senses. This is a heart-to-heart connection that everyone can experience if they open up, love, and listen to the animals. You will discover the beauty and harmony of the natural world, and awaken to exactly what is possible, when you understand that all living creatures are intelligent beings, with their own feelings, emotions, thoughts, desires and perceptions of life. Awaken Your Inherit Ability to Talk to Your Animal Companion! Click on the “SIGN UP NOW” link below for more details and to reserve your spot!